l’Isle-sur-la-Sorgue is a Provençal village so stunningly picturesque, so filled with good things to eat that you can’t help but wonder if it sprung full-blown from the forehead of an editor at TRAVEL or GOURMET. Go out there, kid, and get that village. If it doesn’t exist, make it up! The town is famous for the remarkable way the Sorgue river splits and runs through the town, slicing it into giant uneven jigsaw pieces. A natural defensive moat, the river also came to provide an early source of power for the mills that produced the colorful textiles for which town is also renown. Half the place mats in our house date from our visit a half-dozen years ago. Strolling by myself while my wife was off in search of tablecloths I found a vendor selling what at first glance appeared to be unusual red and yellow olives. I’d never seen red and yellow olives before, but, hey, what did I know, and I was in France. Maybe red and yellow olives were common as beans. Would monsieur like a taste? Monsieur would definitely like a taste. I plucked the olive off her wooden spoon and popped it into my mouth, vaguely aware that she was warning me about the pit. OMG!! as my daughter would say. Sour and sweet. Not olives. Cherries. I bought a liter on the spot, passed to me in a plastic bag with a little pickling juice. What did you get? Jody wanted to know. Oh yeah, they’re great, she answered, already turning away to look at place mats. Oh well, different strokes for different folks. Anyway pickled cherries shake up the order of things (the way summer should). They’re a wonderful accompaniment to pâte or cheese for a picnic, and they’re only here for a little while. When they’re all gone, you can switch back to olives for munchies before dinner or to regular sliced apples to go with cheese afterward. Everything will taste better for it. 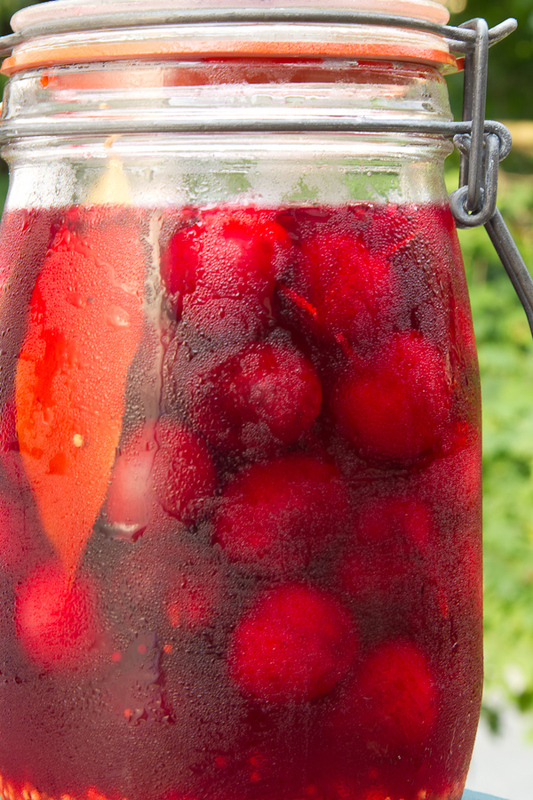 Put the cherries in a clean 1-quart glass storage container. Combine all the remaining ingredients in a medium saucepan and bring to a boil. Reduce the heat to low and simmer 5 minutes. Pour the pickling liquid over the cherries. Allow to cool in the liquid, cover and refrigerate overnight before using. 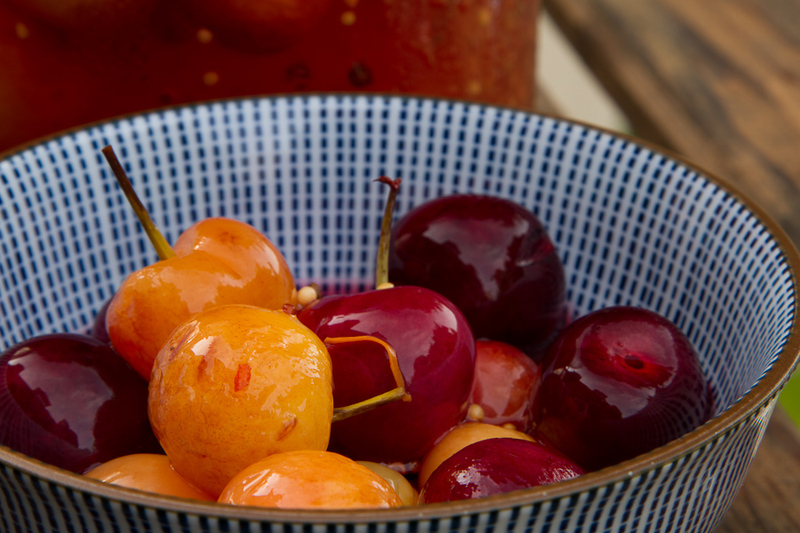 I was in Seattle recently so it was really cool to be working with Rainier cherries after seeing snow-capped Mount Rainier in the middle of June. 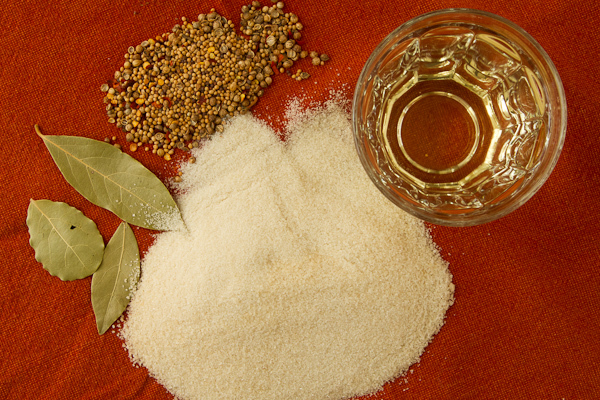 Don’t substitute ground coriander or powdered mustard in this recipe – they’re too strong. Crushed seeds are milder. A mortar and pestle does the trick nicely as long as you don’t get too enthusiastic. The bottom of a saucepan also makes a great impromptu crusher. Spread the seeds on a tea towel on the counter (the tea towel keeps the seeds from from flying everywhere). Set the edge of the bottom of the pan closest to the handle on the seeds, grab the opposite side with your other hand, and roll the edge of the pan around over the seeds. Feel free to add and change the spices to suit your fancy. I used savory spices for this pickle as I want to serve them as cocktail nibbles, but if you’re going to be eating the cherries with something where a sweeter flavor might be nicer (e.g. with yogurt) consider fresh ginger, cinnamon sticks, star anise or allspice berries. Cherries bobbing near the top of the jar will lose their color as they’re exposed to air, and all of the cherries will gradually fade over a week or so, which is fine with me because after I make a batch most get eaten quickly and I don’t mind the faded the leftovers a week or two later – they still taste great. I figured out a way to keep the top ones from contact with air. I trim the snap rim from the lid of 1-pint take-out container. Then I slice a “+” in the center of the lid. Make sure the lid fits snugly inside your glass container. Fit the lid inside the container and push it down until all of the cherries are submerged and enough pickling juice bubbles up through the cross cut to completely cover the lid. 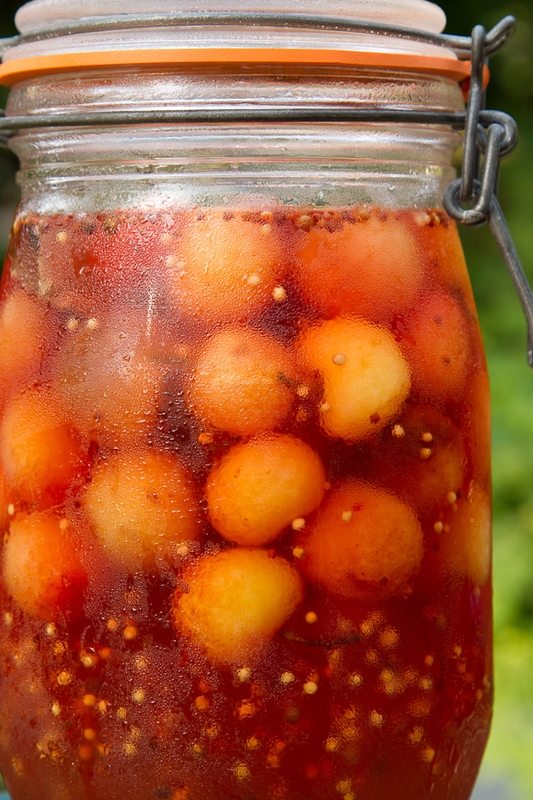 Don’t throw away the pickling liquid after you’ve finished the cherries. You can use it again. Just bring it to a boil and pour it over something – more cherries, peaches, onions, carrots or cauliflower. This entry was posted in Appetizer and tagged cherries, pickles. Bookmark the permalink. Grace Paley! Wildly exaggerated praise, but we”ll take it. We’re having fun, cooking and shooting, wrangling different sensibilities onto the same page. Glad you’re enjoying the posts. Great photos in this post! 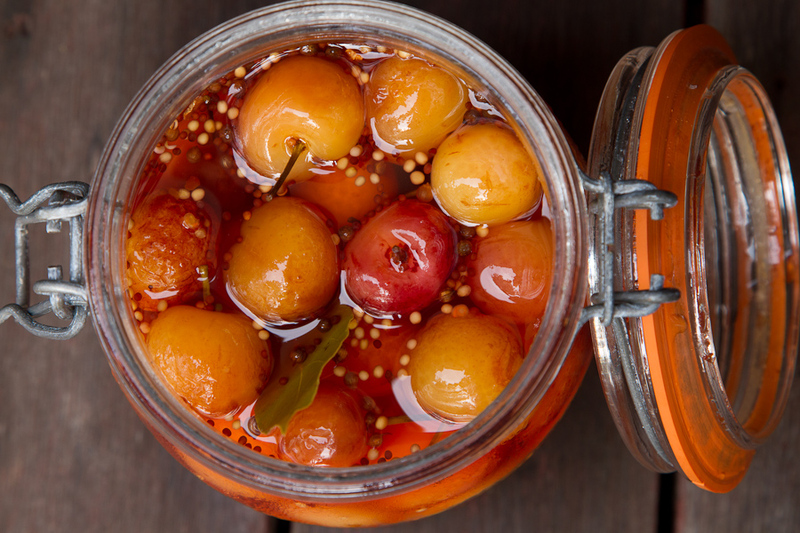 I would love to have these pickled cherries with some charcuterie, cheese and vino of course. Love the plastic lid tip. Sound like lunch on ride this fall. Let’s do it. I’m definitely trying this after getting cherries at this wednesday’s farmers’ market! How about a cherry chutney? Thanks for joining BostonFoodBloggers.com, and I hope that you find it useful and interesting! Great post! And I never thought to use the pickling juice again – learn something new everyday. Gives a whole new meaning to sour cherries, which I LOVE. Let’s make marmalade out of the pickles! Sour cherry marmalade with goat cheese on toast–my favorite breakfast. Thanks for the great recipe. That’s a great idea! Jody was eating them this morning with some chicory I sauteed with garlic last night, along with feta cheese and harissa (a fiery Moroccan chili paste). I may venture in the same direction tomorrow morning. OK to use apple cider vinegar in this recipe? Monika–Cider vinegar is fine. Slightly different character, but it definitely works. Let me know how they turn out. I LOVE it when the recipe turns out just like the picture! I made this this weekend and it turned out perfectly. Added a bit of ginger to the juice, so it had an interesting kick. Thanks for a great idea–never would have thought to try this. Perfect on the ginger. I had to hold myself back in this recipe because I add ginger to everything. Could I make these with sour cherries? I bought some to make pies but then my cherry pitter broke and now I think I want to make a strudel with one quart and pickled cherries with the other. Off to get a cherry pitter. Absolutely! 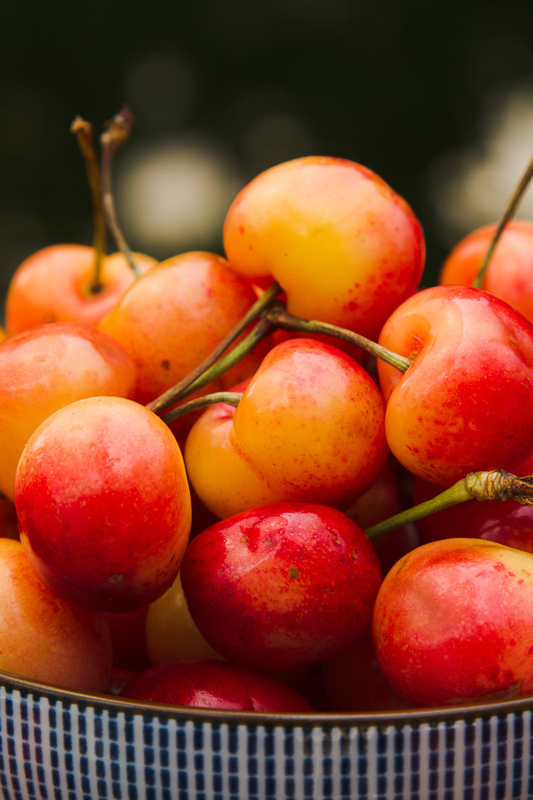 In fact the first time I tasted them was with a French variety of sour cherries that looked a lot like Rainiers. Let us know how it goes.